Seriously. Go make them right after you read this post. So in order to procrastinate on my homework this weekend, I’ve been spending hours on Pinterest. First of all, if you’re not on Pinterest, get on it. It’s super fun and fresh, and completely addictive. Well the secret is cornstarch. Seriously, I’ve had cornstarch in my cupboard for years and I’ve probably only used it once. What’s that stuff for anyways? CHOCOLATE CHIP COOKIES, that’s what. So I adapted this recipe from the one I found on Pinterest, and all my dreams came true. These cookies are, without question, the best chocolate chip cookies I’ve ever had, and for the record I’ve had quite a few. For me, cookies are all about the softness and chew. 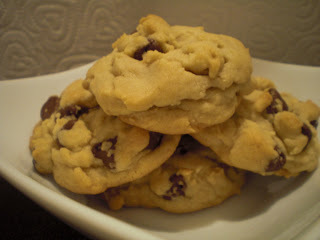 I don’t really fall in love with crispy cookies, and actually I don’t really like most chocolate chip cookies. But they’re everyone’s favorite so I make them a lot. These cookies not only have a great texture, they’ve got rustic style too. Here’s the recipe; take it, bake it, love it. Beat together the butter and both sugars until light and fluffy. In a separate bowl, mix together flour, cornstarch, baking soda, and salt. Slowly add the dry ingredients into the wet. Drop by rounded tablespoons onto a cookie sheet. With clean hands, push dough down just slightly. Bake at 350 degrees for 8-10 minutes. The cookies will be lightly browned on the edges. Don’t over bake. I made these today, but sadly they turned out very flat. I live about 1,000 ft higher than you, so that might have affected the result, but I think I might have measured the flour differently than you. Could you let me know what method you used? Was it the dip and scoop method? The spoon in method? Thank you! Hi Kim! I'm so sorry I missed this comment before! I'm a scoop-measurer when it comes to flour!